The textured red brick and stucco accents on the exterior of the house were painted a neutral gray/brown to compliment the color of the roof shingles. The trim was touched up and kept bright white. The front porch screen and door were replaced with a privacy white square lattice on the far end of the porch. The three security doors were updated by cutting off the scrolling decorative accents between the bars. One double window and two single windows had to be removed and bricked up to allow for a more efficient use of space in our designs. All exterior doors were painted with glossy black used on the security doors as well. All of the landscaping was refreshed by removing, transplanting, and adding evergreen bushes, plants, and flowers. The picket fence and trellis in the backyard was painted white to compliment trim on the house. The garage doors and trim were painted the same color as house. An 8ft wood privacy fence was added to the back property line. A large shed located in middle of back yard was removed to allow more space and a better view from the house. Lastly, a new water line was added to the street to accommodate the added master bathroom. Leveling and sodding was done to cover these areas after work was completed. This entry room was made into more usable space by closing up one of the double doorways into what is now the front bedroom. The French door from this opening were reused in the dining room. The existing mosaic hearth was replaced with black limestone to complement the black front door. The ceiling fixture was replaced with a rubbed bronze semi-flush light. The corner radiator was removed and patched creating more usable space. 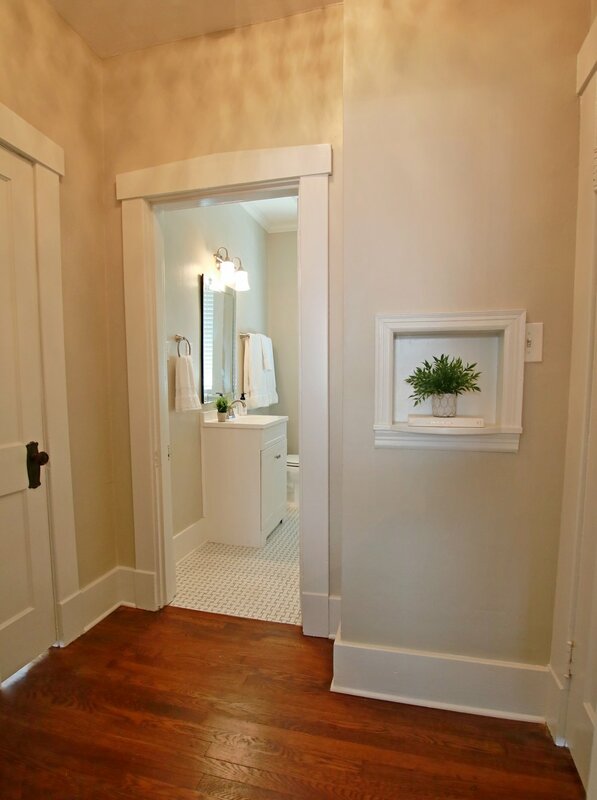 Craftsman inspired wainscoting was added to the walls and then painted the trim color. 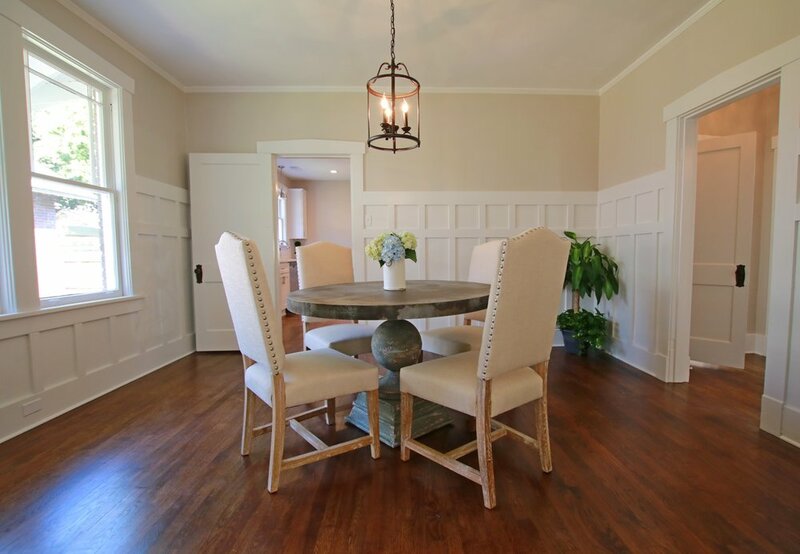 The design of wainscoting reflects the square/rectangle shapes of existing doors and windows. The dated chandelier was replaced with a round bronze fixture. The corner radiator was removed and patched after all new AC and heat was added to the house. These two large bedrooms received fresh wall and trim paint and refinished floors. Radiators were again removed. Closets were reworked. Fan lights were restored and added. In the front bedroom, exterior and interior double doors were removed for safety and aesthetic reasons. We replaced these doors with a single window that we removed from another part of the house. AC window units in each bedroom were also removed and broken glass was repaired in several windows. Before renovation, this was the one and only bathroom for four bedrooms. 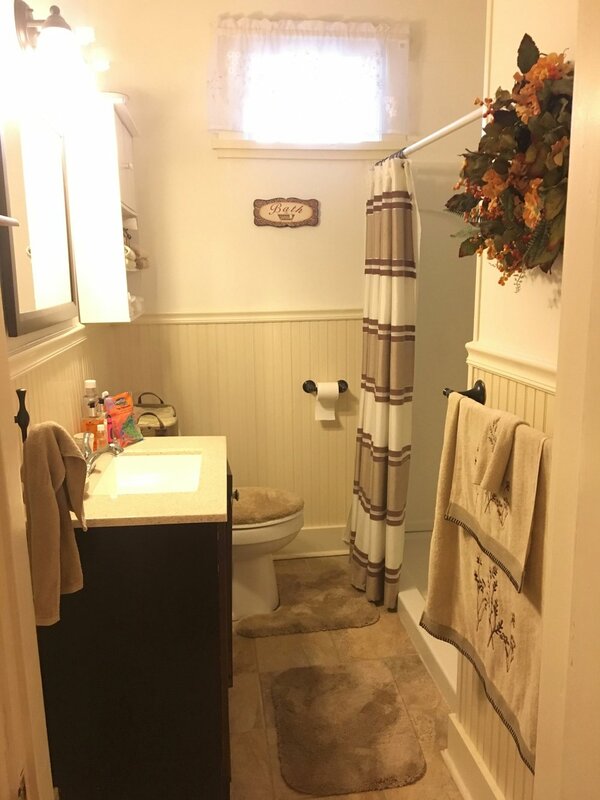 Originally, we thought this bathroom would only require cosmetic updates, however we soon found out that previous leaks caused all of the supports under the bathroom to rot and need to be replaced. Therefore, we had to remove all flooring down to the floor joists. 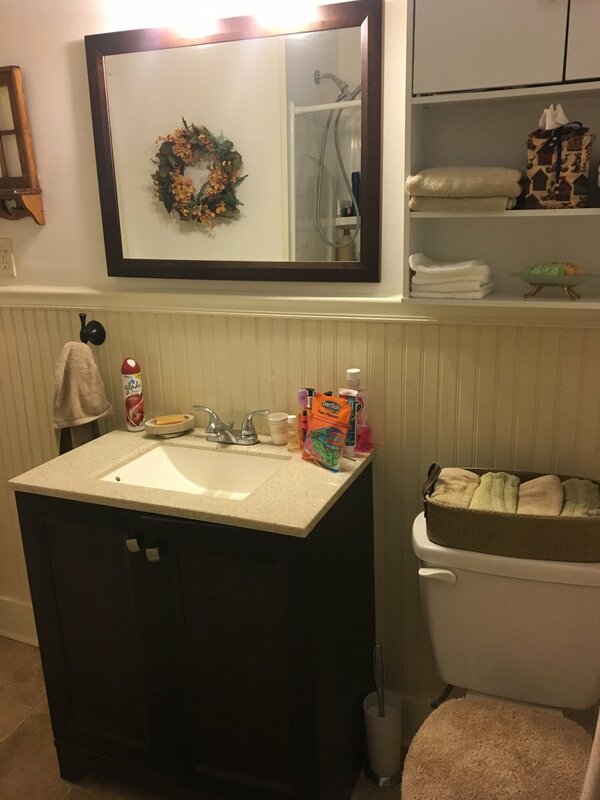 Then, once everything was structurally sound, we leveled, reinforced, and replaced the bathroom flooring with basket weave design tile. Additionally, we replaced the acrylic shower stall with a cement board base, subway tile on the walls, and a steel tub/shower drain. For the window, we reopened and replaced the partially covered window and reused old trim taken from other parts of the house to match the rest of the old windows. All old fixtures were also replaced with new brushed nickel fixtures and accessories. The kitchen was made more spacious by removing walls, a window, a doors, and a pantry. Additionally, the doorway to the adjacent den/family room was more than doubled in width to create a more flow and open concept. 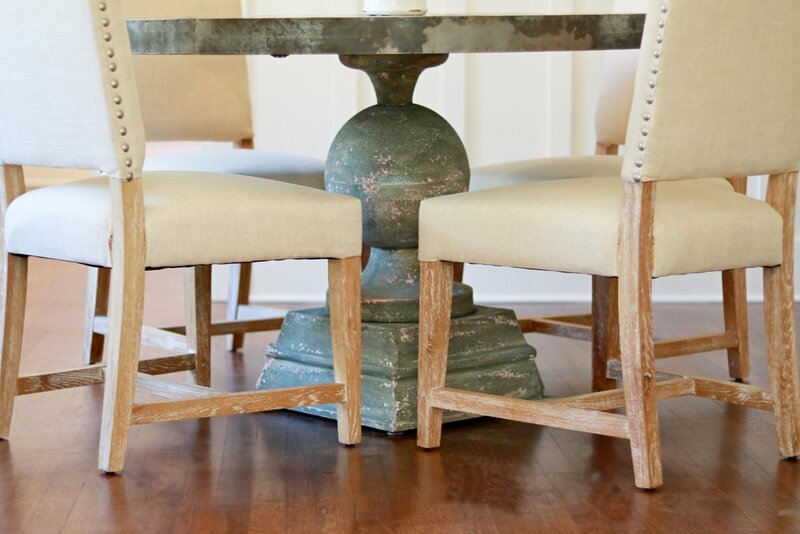 Pine and oak floors were uncovered from underneath four layers of laminate flooring, then patched, repaired, and refinished along with the floors in the rest of the house. Plaster walls were removed down to the studs to allow for all new plumbing and electrical installations in the kitchen. Walls and ceilings were then covered with new sheetrock. All lighting was replaced with one pendant light fixture over the sink, recessed cans throughout, and a ceiling fan in the middle. All cabinetry was replaced with new white shaker wood cabinets. All new stainless appliances along with a gas stove exhaust hood were added as well. The cabinets were topped with gorgeous white/gray quartzite. The backsplash was done with beveled white subway tile. The laundry room is by far the most improved room in this entire renovation! Before, this space was an un-floored crawlspace open down to dirt ground and the laundry was in the kitchen. In order to turn this scary room into a spacious separate laundry, we removed the broiler, hot water heater, and numerous old pipes. Then, we gutted the space, brought the floor up to the height of the rest of the house, and finished out the rest of the spacewith tile, drywall and paint. We also reused the two original wall cabinets from the kitchen on the side walls for laundry storage. The needed electrical and plumbing additions to make the space ready for the addition of a washer and dryer were also done, as well as enlarging the small door to the space. This den/family room underwent quite the transformation during our overall renovation. Before, this space was very outdated with dark knotty pine walls/ceilings, wall to wall carpeting, AC units in the windows, and no open concept to the kitchen. To make the space feel brighter, more spacious, and very inviting, we removed the carpeting, added new hardwood floors, painted the paneling Sherwin Williams Pure White, added new windows, removed a wall, expanded the cased opening into the kitchen, and did a little staging to seal the deal! Now, this room is ready for entertaining and spending time with your family! As in the den, the dark knotty pine paneling was painted Sherwin Williams Pure White. We also removed two small corner closets to open up floor space, but left one original closet in this bedroom and finished it out with no built-ins. The oak flooring was patched where walls were removed for the closets. All original hollow doors in this space were replaced with old solid wood, multi-paneled doors that we reused from other places in this project and projects at other houses. Additionally, we replaced the ceiling fixture with a flush mount oiled bronze fan. This master bathroom and walk in closet was created by converting the 3rd bedroom off the master bedroom into a luxurious, spacious bathroom. This was made possible by closing two doorways, incorporating a kitchen pantry and small clothes closet, and removing two windows. This created space for a massive custom walk-in closet, water closet, a 4ft x 5ft shower stall, and double sink vanity. The shower consists of large subway tiled walls, honeycomb marble floor, recessed light/vent, and frameless glass door. The main floor is 1ft x 2ft marble tiles. Above the vanity is a full wall mirror on which the sconce is mounted.